It was reasonably fast, had fewer security holes and was produced by hippies who’d attended Woodstock and still lived on a commune. This blog is written mostly for my own enjoyment. That sentence prefaces this entry in an attempt to give myself permission to write about geeky, nerdy stuff. Specifically web browsers. In the enlightened 2010s most web surfers still use Microsoft’s Internet Explorer. IE has been a horrendous browser. Sorry Microsoft, it has. Users don’t notice, but developers will quickly let you know IE has been a non-standards compliant nightmare and about as secure as a pup tent! It’s gotten better in its latest iterations, but it’s still s-l-o-w. I moved away from Internet Explorer a few years ago. My browser love was committed to Firefox the open source browser from the Mozilla Foundation. Firefox had everything a good dweeb needed. It was reasonably fast, had fewer security holes and was produced by hippies who’d attended Woodstock and still lived on a commune. OK. Maybe that’s a slight exaggeration. Firefox, is created by an international movement of thousands, only a small percentage of whom are actual employees. About six months ago I began to use Google’s Chrome browser. It was stark. Almost immediately I realized I didn’t like it. Sure, it was faster than Firefox–noticeably faster. It just didn’t have Firefox’s huge collection of add-ons. That was the deal breaker. Yet somehow I kept getting drawn back to Chrome. Today 90% of my web time is spent using Chrome. It’s the speed. There’s that much difference. It feels like I’ve got a new PC. Unfortunately some sites insist I use something other than Chrome. I can’t always be sure why. Firefox and IE have to remain on standby. Google doesn’t need my proselytizing. Chrome will catch on without me. I just wanted to give you a heads up. It’s worth checking out. I’d love to use Chrome, but my bookmarks sync across my Mac, iPhone, and iPad pretty seamlessly with MobileMe and Safari. So I rely on that a lot. One day, maybe there will be a way to sync Chrome with MobileMe. I know there is XMarks, but that’s kind of hacky and another program to run. And as a web developer, yes IE is a nightmare. It’s a lot less of a nightmare, but still one. What’s worse is that a lot of my clients still insist on IE6 compatibility. Oh boy. My son turned me on to firefox, and have never gone back to IE EVER!! 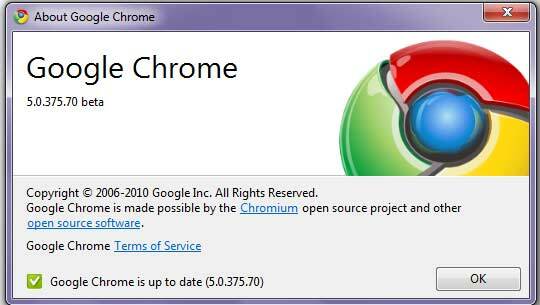 Never tried Chrome….hmmmm something to think about!